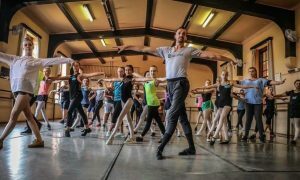 Some dance opportunities, whether they are full-time company jobs, guest artist gigs or summer programs, are away from home. So when it comes to auditioning, and time and finances are not available to travel, there has to be another way to put yourself out there. Auditioning by video is cost-efficient and convenient, and it allows you to compile one collection of your work to send and show to multiple directors. While some directors are open to hiring dancers via video, some do have their reservations. Here, find out some tips, from both the dancer and the director perspective, on how to best audition by video. A main advantage to submitting a video audition is the financial practicality. Dancers may not have the money or time to travel around on an audition tour. Auditioning via video, then, can be a good alternative. Also, if a live audition causes you much anxiety, then submitting a video audition can relieve the feeling of competitiveness. Northeast Youth Ballet Artistic Director Denise Cecere hired Sayaka Ohtaki, currently a soloist with Ballet West, after a video audition. Ohtaki, here with Guest Artist Attila Ciski, sent her video from Japan. Photo courtesy of Denise Cecere. As a director, video auditions may have their benefits as well. Denise Cecere, artistic director of Northeast Youth Ballet, says she is sensitive to the financial burden that traveling to auditions costs the dancers and welcomes a video in its place. She has hired many guest artists this way, most of whom were also recommended to her by a colleague. In addition, video auditions save her time. “There is no scheduling the audition or interview,” Cecere points out. Auditioning by video does, however, have its downsides. It is a less personal way to introduce yourself and your dancing, and it doesn’t give you the opportunity to get a feel of the company and/or director. Also, it is easier (although never recommended!) to manipulate on a video or digital format. Perhaps you chose a dance clip from five years ago, or selected a very one-sided presentation. Directors sometimes fear that what they see on video is not what they’ll eventually see face-to-face in the studio. “You often see the highlights of a dancer and are sometimes surprised at their lack of ability and consistency in the studio once you start working together,” Cecere says. In addition, “the energy, interpretation and artistic qualities are not perceived the same through videos as they are translated live,” Lara says. Don’t make your video audition too long. Don’t include a whole ballet or parts of a work in which you’re not present. Cecere suggests a length of three to five minutes. Kerollis adds that if you can’t cut down your footage, put your strongest work first. That way, in case the director is short on time, he/she won’t miss the best part. If an audition ad or website states a specific time for your video, abide by that. Do follow any guidelines the director or choreographer sets out for you. Select dance excerpts that are appropriate for that company. “If a company asks for something specific, follow instructions or they may not look at it,” Kerollis says. Dancer Roberto Lara submitted a video audition and received a contract with Les Ballets Trockadero de Monte Carlo back in 2006. Photo by Ginevra Danielli. When sending out your video audition, whether via email or postal service, be sure to also include your resume, photo and a letter stating your interest in the company or organization. “Make it very clear that if there is interest, you will make every attempt to work it into your schedule to meet them in-person, that you look forward to taking an audition class and welcome an interview,” Cecere says. She adds that she appreciates when a well-done package is mailed. “It gives me the impression that the dancer has taken the time to prepare something for my enjoyment and wants to dance for us,” she says. Whether you send your audition via email with a YouTube or Vimeo link or via mail with a DVD, be sure to follow-up with an email or phone call afterward. “If I don’t hear from the company that they received my materials, I may follow-up with an email to check in and make sure they received it,” Kerollis says. ~ In summary, an audition is a two-sided process. So, even if for the meantime a video audition is the best option, it may be best to eventually arrange for an in-person meeting. Since video auditions are sometimes not the most preferred method of auditioning, don’t be devastated if you don’t get hired. Photo (top): Barry Kerollis, a freelance dancer, here in Romeo and Juliet with Fort Wayne Ballet, one of the companies with which he has successfully worked after submitting a video audition. Photo by Jeffrey Crane.